(Bloomberg) -- The stock market’s best quarterly surge since 2012 has largely been ignored by buyers of exchange-traded funds. These investors continue to shun the S&P 500, despite the index’s 12 percent gain, instead pouring $33 billion into fixed-income funds, data compiled by Bloomberg show. 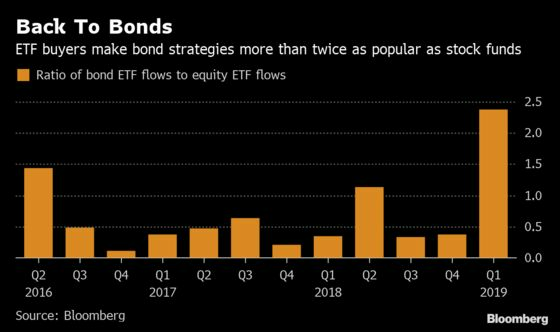 That’s more than double the $15 billion absorbed by stock ETFs in the quarter through March 27, and the largest ratio of flows into bonds over equities in three years, the data show. Stocks are rallying after their worst quarter in seven years and investors who got burned appeared reluctant to trust that the pain is over. Weak economic data across global markets and an even more dovish stance from the U.S. Federal Reserve have meanwhile inflamed recession fears, pushing many into safer strategies. Equity ETFs started the year with outflows as investors digested a December plunge that took stocks within a whisker of a bear market. January has often been a tough month for such funds as advisers seek to minimize client tax bills, analysis from Bloomberg Intelligence shows. But interest remained subdued in February and March, flows show. Debt funds have by contrast added money for five straight months. Bonds are a natural choice for anyone concerned about the end of the cycle, Donald said. 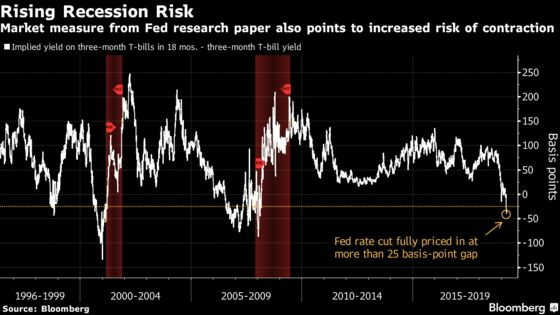 Treasuries have steadily rallied since the Fed signaled last week that it was done raising rates this year, with a portion of the yield curve inverting for the first time since the last financial crisis -- a sign some watch to warn of a possible U.S. recession. But ETF flows suggest investors are, cautiously, putting cash back on the line. A spate of disappointing data could cause Treasury yields to fall even further, and low defaults and robust growth support the appeal of some riskier investments, according to Lara Rhame, chief U.S. economist at FS Investments, which manages $24 billion. 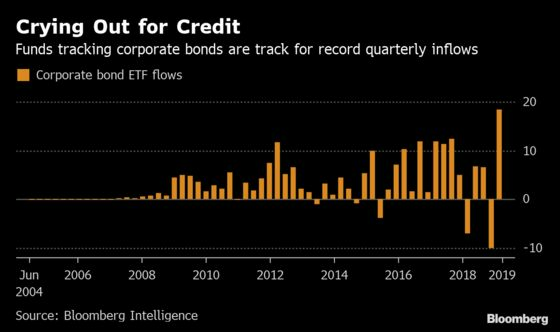 Within the safety of bonds, higher-yielding strategies are the clear winners with funds tracking company debt adding more than $18 billion this year, on track for a record quarter, data compiled by Bloomberg show. Two Vanguard Group funds -- the Vanguard Intermediate-Term Corporate Bond ETF and the Vanguard Short-Term Corporate Bond ETF -- are leading the pack.